Please join me on Twitter and Facebook. Patricia Ritzo is a local Maine artist who lives in Kingfield and Falmouth. Her work depicts the natural surroundings in which she lives, the mountains and the sea. Patricia has worked in several different mediums over the past thirty years, watercolors and pastels but she now most often works in acrylics. The paintings being exhibited include such local scenes as the fields and flowers of the Maine Audubon Society’s Gilsland Farm and Casco Bay water scenes. Favorite subjects of hers are: her daughters, Molly and Jolie in garden settings, the natural beauty of Kingfield and the coastal treasures of Falmouth with the ever changing light on the ocean. Patricia Lawrence Ritzo paints with a bold and vibrant style. She loves color and she likes to work on big canvases. Her work is expansive and free, yet she possesses exceptional drawing skills. Her paintings combine bigness with daintiness in a most natural way. Her color is strong, yet her lines are refined as evidenced in her large still life arrangements of flowers. 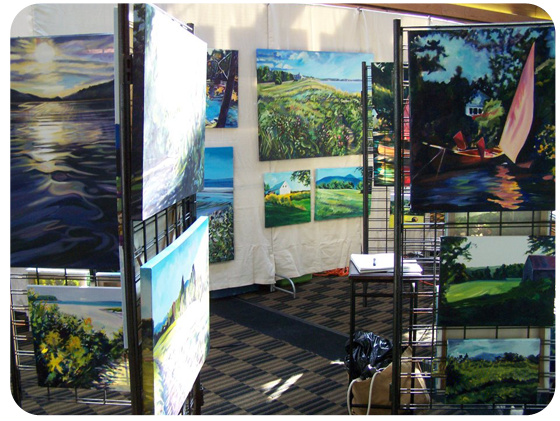 Patricia Lawrence Ritzo’s paintings convey a passion and zest for life. Magnolia’s Café was proud to host recent work of Paricia Lawrenece Ritzo, entitled “Forecast: Summer” this past spring.